Get ready to GLOW! If you want your skin to look luminous without the glitter and sparkle, we have the perfect product to add to your skincare routine. Get a subtle and radiant shimmer with Ambre Glow. 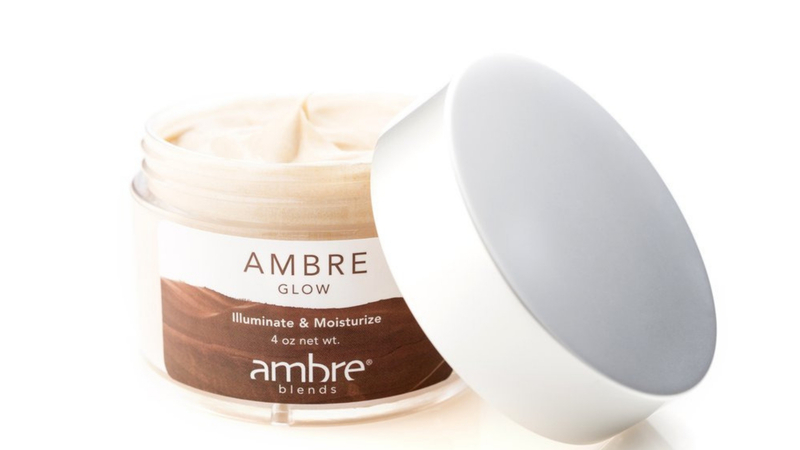 Ambre Glow is an illuminating moisturizer that not only is incredibly good for the skin but it also leaves a shimmer glow effect that looks amazing on all skin types. Ambre Glow radiates the aroma of Ambre Essence and can be worn in combination with all other Ambre Blends products. You might be wondering about squalane and why we use it. Squalane is a natural ingredient derived from olives. It is an antioxidant-rich age-fighting emollient which occurs naturally in the lipidic layers of the skin. Squalane prevents moisture loss while restoring the skin’s suppleness and flexibility. Using squalane will lock moisture into your skin, help prevent fine lines and ease dry patches all while fighting free radicals. You can see why we love it for soft, healthy skin! There are so many ways to wear Ambre Glow, it’s all about your personal preference. We love to use Ambre Glow to highlight bone structure, whether on your face, collarbone, legs, shoulders…it’s up to you! Dab it around your eyes or use it as a highlighter for your cheek bones. It makes a great addition to your makeup bag for special occasions, a night out on the town, weddings or any time you want a little extra glow about you. But you don’t have to ditch your other Ambre Blends products for Ambre Glow. We have some customers that mix Ambre Glow with the Body Cream and Skin Tonic, which makes for a triple power packed skin smoothie! Ambre Glow comes in a 4 oz. jar and trust us when we say that a little goes a long way. If you’re looking for a subtle shimmer or a new highlighting tool, add Ambre Glow into your beauty routine!